Basketball is an extremely popular sport in Aussie and has thousands of players and fans all around the country, in schools, universities, colleges and clubs. The famous shape and colour of the classic basket ball is known world over and is instantly recognisable. Any basketball fan will be thrilled to get one of these miniature balls as a fun freebie. These little balls are sure to find their way into offices and homes all around the country. The design features a round ball covered in tiny dimples that every basketball fan knows. The colour is bright and bold and the iconic dark lines work their way around the ball to complete the look. Two circles run around the sides, one around the middle and two straight lines join them together. Talk to us about branding your personalised company image onto the balls, our listed price includes branding of your logo or graphic in a single colour print. 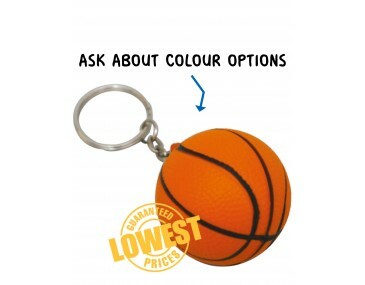 Stress ball key rings are great unusual give-aways and are ideal promotional items any business operating in the sports industry, sports clubs, school and colleges or any business wanting to support or promote basketball in our country. For larger orders ask us about our custom made indent production service. Please note that our prices exclude GST and a print set up of $75 applies.